The Smallest Hat in the World? 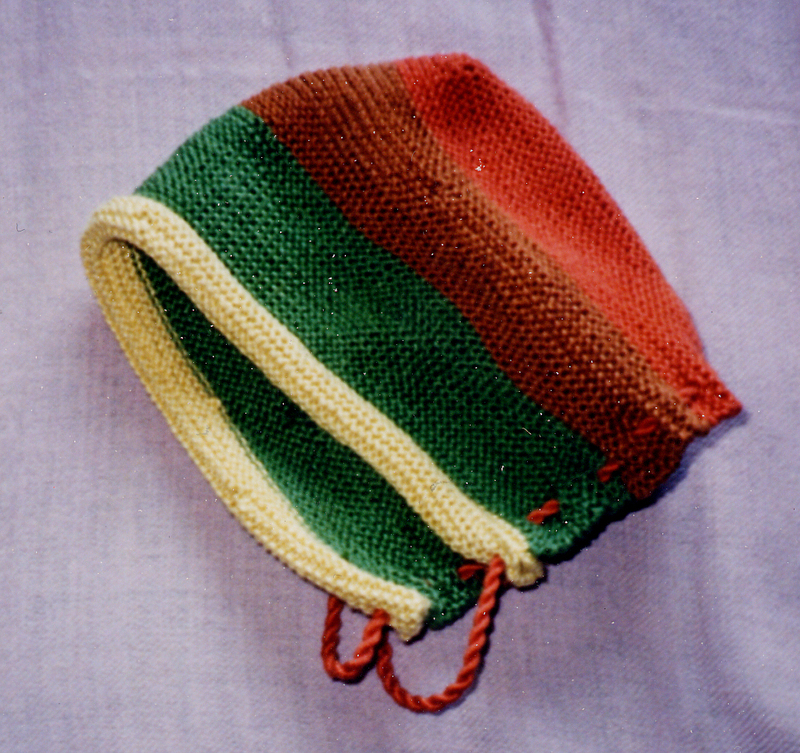 This is a multi-coloured hat I made for my friends baby. However, the hat was so small it only really fit the baby for about a week or so. The colour combination works really well, I think, as it can be worn by either boy or girl. 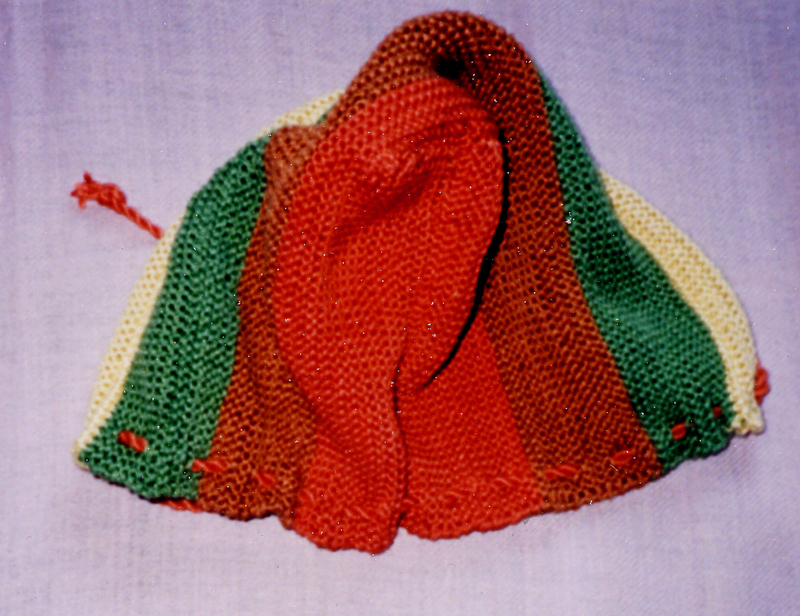 It’s a very straight forward pattern, taken from the same magazine as the booties (pity I don’t have the front cover anymore, it would have been good to let people know). 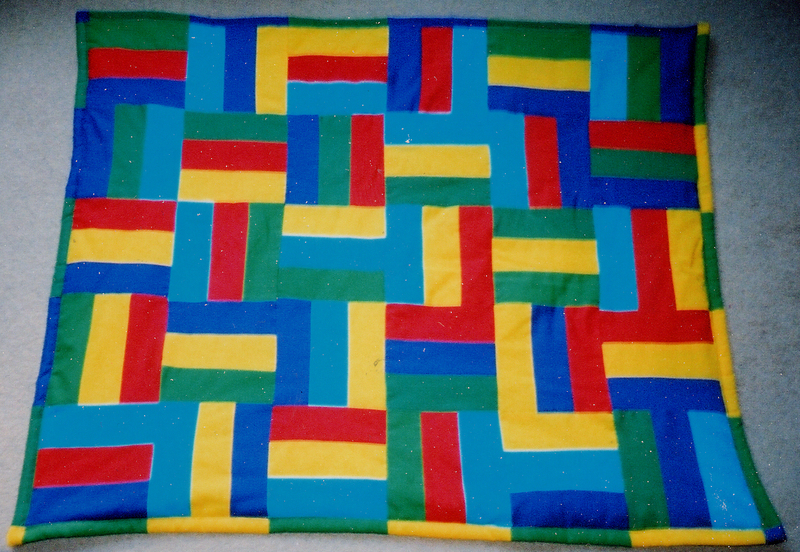 It’s a straight T-shaped piece of knitting that then gets sewn together. When finished it makes a very nice shaped little hat. So on to my other projects. I’ve finished my friend’s shirt, I only have to iron it before sending it on to him and more importantly taking a picture to put up here. It’s worked out really nicely, a white collared shirt with a drawstring front, is anyone else thinking of pirates?! I’ll make sure I put it up soon! The fact that it took so long to make made it that much more rewarding when it was finally finished. It’s found a very good home with a good friend of mine. 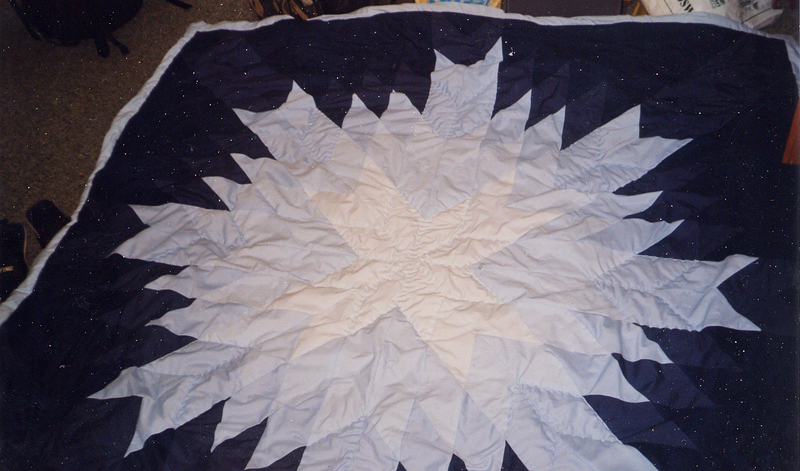 I’d like to think of this quilt as a bit of a work of art, especially as it looks rather good, don’t you think? 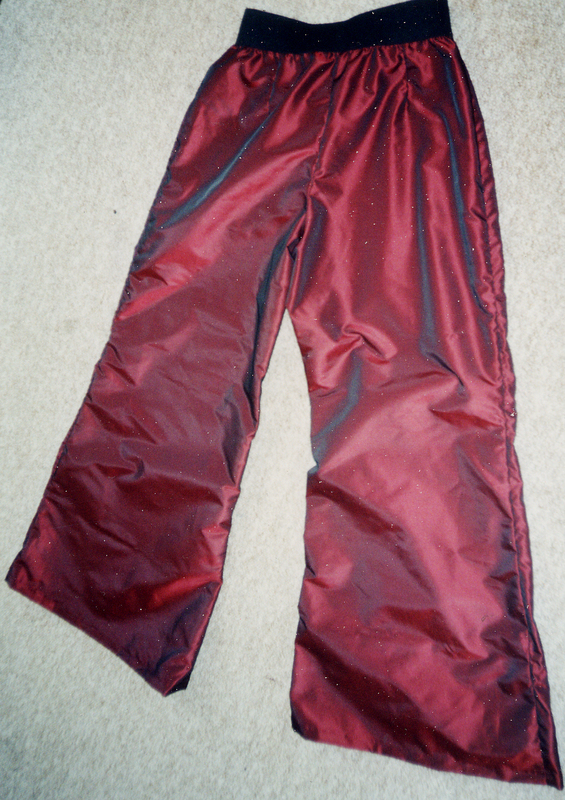 The back was a bright red, which works quite nicely. 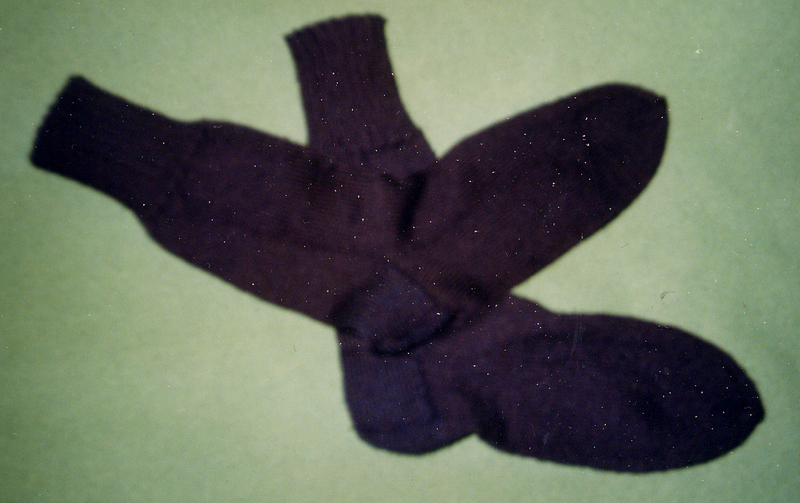 I’ve knitted my fair share of socks in my life, strangely enough I don’t often take pictures of each pair. But trust me there have been lots. 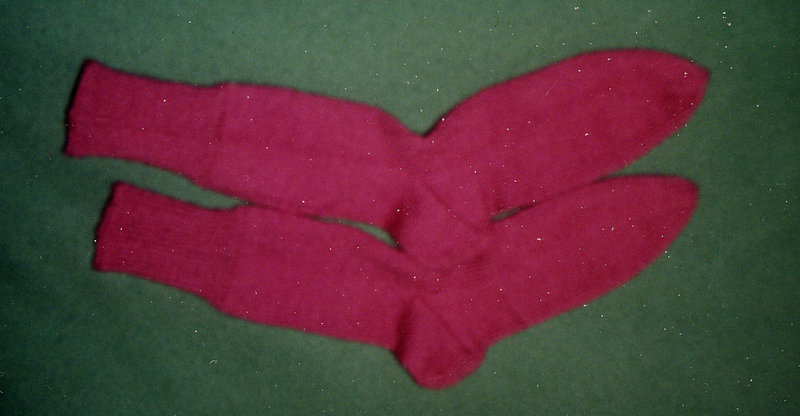 This is a very large pair and socks, as many of you will know, can be made in all sizes. 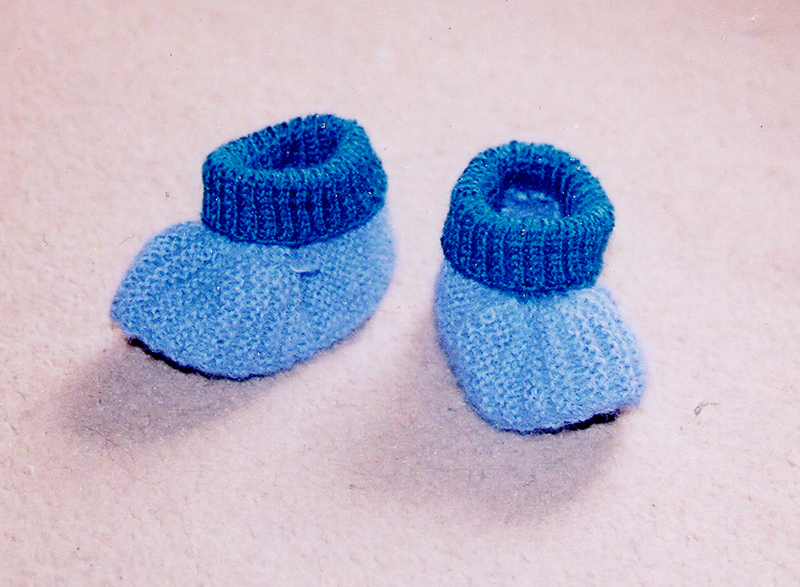 However, I’ve not yet made a baby or toddler pair of socks, maybe it should be one of my next projects? Now, I’m currently working on a few different things: a shirt for my friend (he’s been waiting for this for about a year or so), a baby cardigan (knitted) and a little dress (sewn). I’ll put them all up as soon as I’m done. In the meantime I’ll make sure all the stuff that I’ve previously made gets added on here! Firstly I’d like to thank myknittingblog for the first comment, I feel like I belong now! 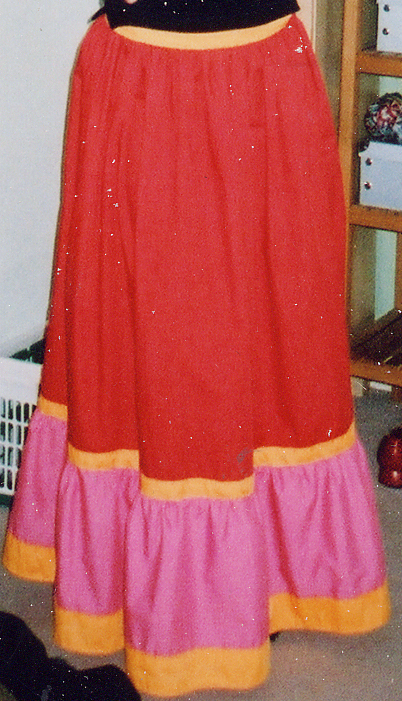 I designed and made this dress and trouser combination about eight or nine years ago, for my best friend Kerstin. 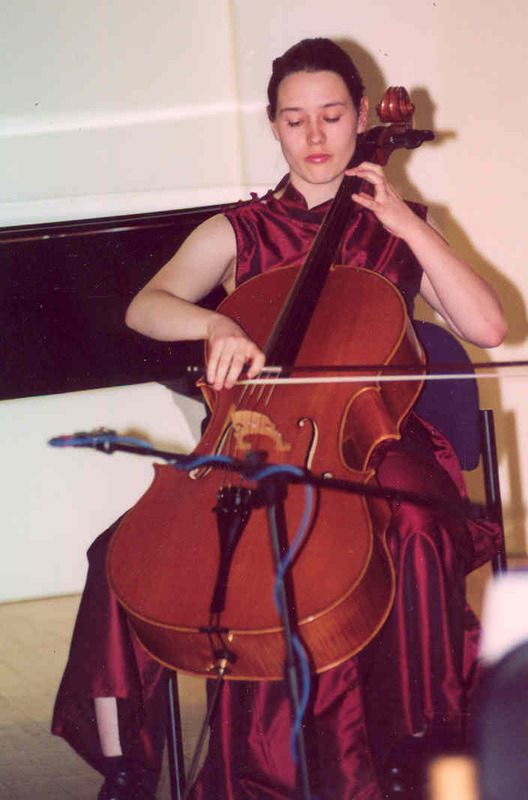 She plays the cello and needed a dress that she could wear for performances. The design process was quite challenging, although it might not be immediately apparent. I initially drew the design and then made a first version out of cotton, which enabled me to make some minor edits and changes as I was sewing the cotton version. 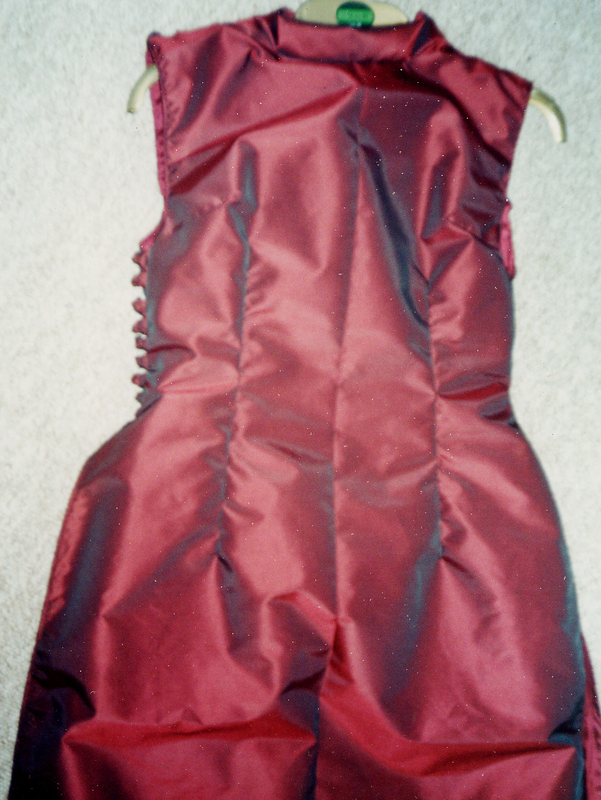 Kerstin had bought some satin/silk in this luscious red. It’s not very visible on these pictures, but the dress is basically open on both sides to just above the hip. This ensures that the bellbottom trousers go underneath and while Kerstin is wearing the dress it looks like it is one dress. However, when she sits down the legs come out, so enabling her to play the Cello. It was challenging making this combination, but also very rewarding, as my friend was very happy and pleased with the end result. And doesn’t she look lovely in it?! These booties are not made for walking! These kinds of boots have seen many baby feet. 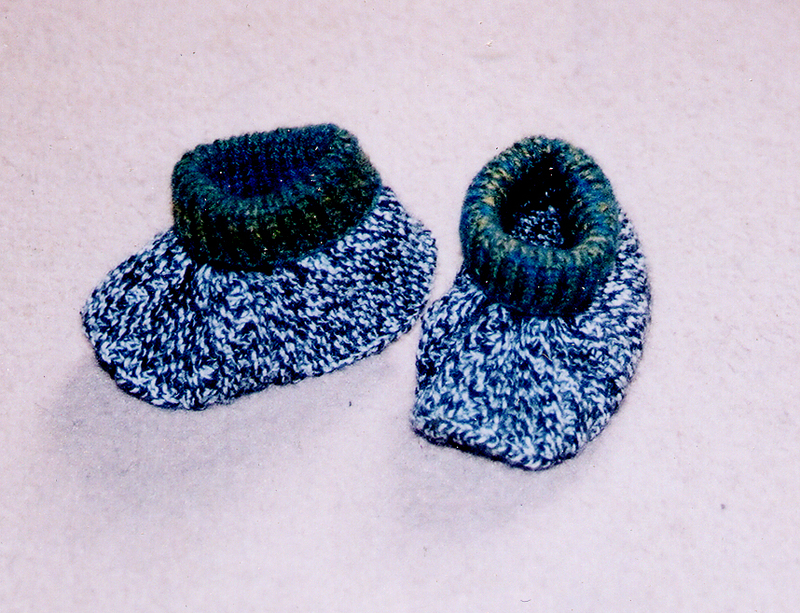 I like to knit them for pretty much anyone that is having a baby, as they are very easy to make. The choices of colour combinations are also quite inspiring, as no two every look the same. I am usually able to knit one pair in one night in front of the TV. Strangely enough I find I knit quicker when I’m not actually looking at my knitting, apart from when I absolutely have to, what’s with that? 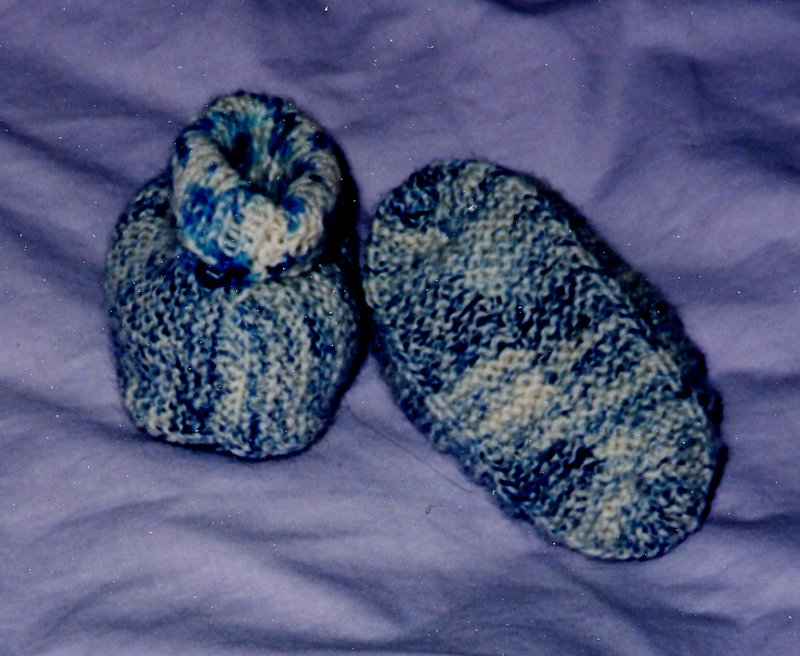 When I first started knitting these booties about 12 or 13 years ago, the pattern came from a German magazine that had many patterns of baby clothes. Unfortunately I can’t remember the name, as I have used it so much that the front cover of the magazine has disappeared. 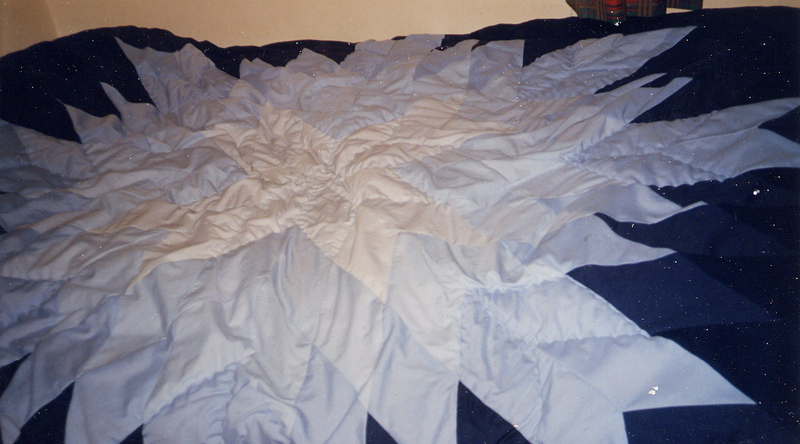 I have over the years made some minor changes to the pattern and have personalised it a little bit. Overall it is an easy knit that makes a very nice present! This skirt was made for a friend of mine, who picked out the materials and thus chose the colours. I really like the combination of the pink and orange, as it seems to give the skirt the feeling of summer being just around the corner! It was a very easy pattern, unfortunately I can’t even remember which one it was. Most likely one out of a Burda magazine, as those are the best patterns in my eyes. I had to use quite a lot of material, which, once gathered, gives the skirt the best effect. 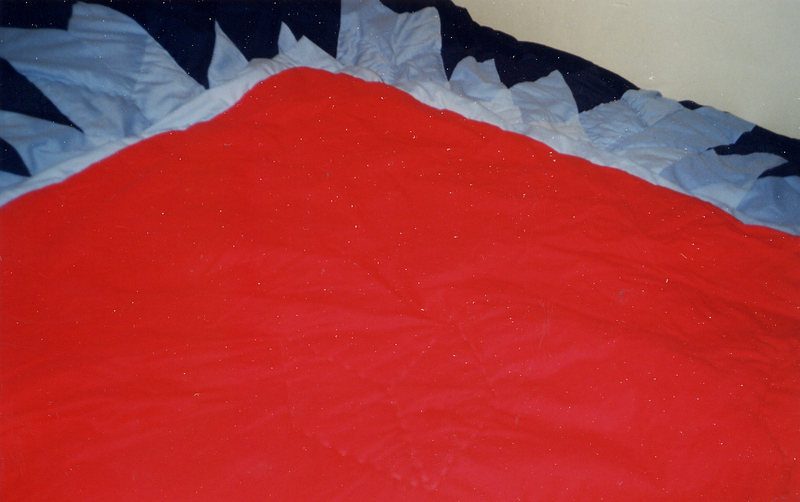 Here is a picture, which was taken in the days before I had a digital camera, so it’s not the best picture. But at least it gives everyone an idea of what the skirt looked like in the end. 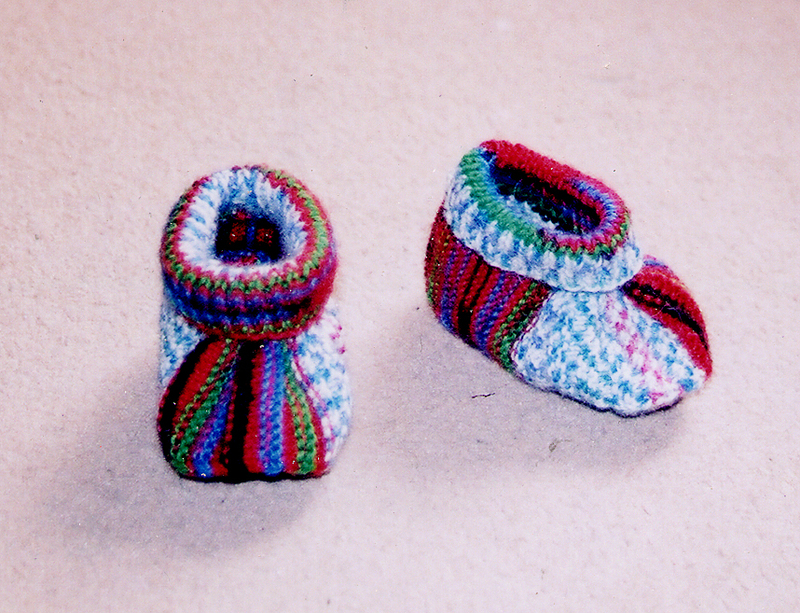 So, this is an attempt to publish some of the items I’ve created, such as baby boots, coats, skirts, baby quilts, etc. Maybe people will enjoy it? !